German Talmudist; born at Lissa; died in Berlin June 12, 1743. As a poor young man he went to Berlin, where he was adopted by a Frau Tockels, whose name he adopted in gratitude for her kindness. 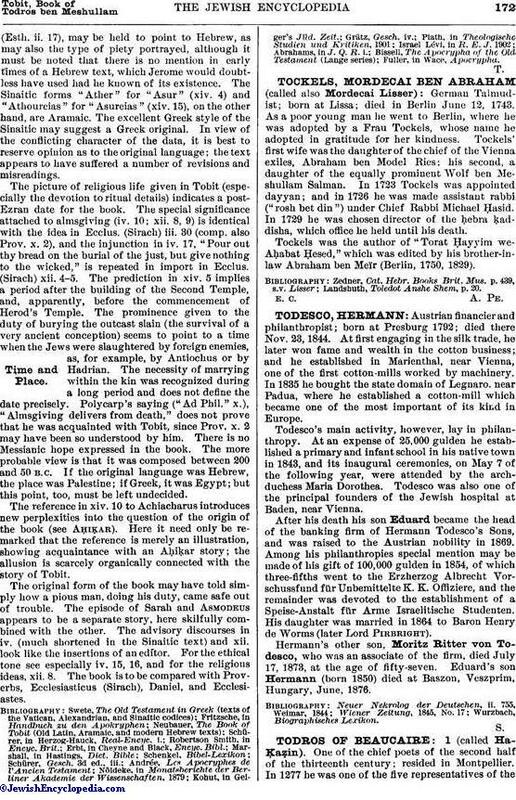 Tockels' first wife was the daughter of the chief of the Vienna exiles, Abraham ben Model Ries; his second, a daughter of the equally prominent Wolf ben Meshullam Salman. In 1723 Tockels was appointed dayyan; and in 1726 he was made assistant rabbi ("rosh bet din") under Chief Rabbi Michael Ḥasid. In 1729 he was chosen director of the ḥebra ḳaddisha, which office he held until his death. Tockels was the author of "Torat Ḥayyim we-Aḥabat Ḥesed," which was edited by his brother-in-law Abraham ben Meïr (Berlin, 1750, 1829). Landshuth, Toledot Anshe Shem, p. 20.